S.D.G. All Glory to God Alone! The Faith Baptist Church Library is His and He’s present! It is what “Christian Church” libraries were always intended to be- a reflection of Him and His will and it’s here in our church. Give all the praise and glory to Him! A place for Him to minister to us every moment of every day. A place where the focus is on Him alone. Those who are seeking to grow spiritually, prepare to teach, or minister to others come, seeking His will in all things- come- but oh! What a place for the lost and broken! In Altoona, God has given us WJSM to listen to 24 hours a day and this library that is growing daily to enable us to live in the world as it is today! Beginning as we enter our church building, all informational sources surround us on tables, bulletin boards, book racks, library carts, window sills, and walls- God cries out to us to see and know Him and reach out to our fallen world! When you walk through our church, every inch should reflect Him as the center of our lives. Come in during the week any day, when it’s quiet and it is just you and Him. Bring a lost soul along. Sofas are in the lounge downstairs and in the library to sit and read, meditate and pray. Sundays and Wednesdays we worship and fellowship together. During the week is a time of solitude with Him alone and what He has planned for us, uniquely meeting our needs and in using the talents and gifts He’s given each of us and then give Him thanks for everything! All in one place…. FAITH BAPTIST CHURCH. 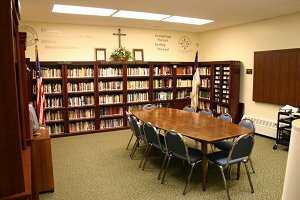 The library is an important part of every church. We are to learn and grow in our faith every day of our life till He calls us home. Our library reflects the love and devotion of all of us to Him and His will.